MyPic Studio Debit Cards allow you a way to personalize your Bank 1st Debit Card to be uniquely yours! The MyPic Studio Debit card still has the same functionality of a regular debit card (refer to the debit card page for further details) but can be personalized to include a favorite photo or picture of your choice. Choose from an edge-to-edge photo card, a 2x2 photo card or a 1x1 photo ID card. Select the desired sized photo card on the right and you will be redirected to the site to upload your photo and design your card. Follow the prompts at the MyPic Studio design site and submit for approval. For best results, upload a high resolution image. Our current Image upload guidelines restrict the use of certain types of images. The following guidelines have been put in place to help you with your selection; however, Bank 1st reserves the right to approve or deny any image at our sole discretion. The better quality the image, the better the final card design will look. Some cell phone images may not produce the high-quality; high-resolution image required for Bank 1st MyPic Studio Debit Cards and cannot be used. For most digital cameras, select the highest quality setting for best results. After uploading your image to the Bank 1st MyPic Studio Card site, you’ll be able to manage the image using the card production tools such as scaling, moving, rotating and flipping. If you do not wish to upload your own image, you can select an image already available in our image gallery located on the Bank 1st MyPic Studio Card production site. You can also select an image from the gallery located on the MyPic Studio design site. The gallery includes images such as West Union points of interest and local school mascots. Click on the drop down box under the heading Gallery and look at the many choices available. Please review the Bank 1st MyPic Studio Debit Card Terms and Conditions. Bank 1st MyPic Studio Debit Card service is subject to these Terms and Conditions. The Image submitted by you is herein referred to as the "Image". You certify that you have read and understand the Image Guidelines and that the Image you submitted to Bank 1st complies with the Image Guidelines. You warrant to Bank 1st that: 1. You are the owner of the Image (i.e. the Image was taken by you) or you have obtained express consent from the Image's owner to use the Image on your Bank 1st MyPic Studio Debit Card; 2. You obtained express consent from any person whose Image you use on your Bank 1st MyPic Studio Debit Card; and 3. Use of the Image by Bank 1st will not infringe any other person's rights, including intellectual property rights, in the Image. Each time you upload a new picture to the MyPic Studio, a new card will be sent ot you and the applicable debit card replacement fee will be assessed. If you wish to upload a new image without receiving a new card at that time, please call the bank at 563-422-3883 for further instruction. You grant to Bank 1st a perpetual, non-transferable, non-exclusive, royalty-free, world-wide irrevocable license to use the Image and the data you provide to Bank 1st for the purpose of providing you a Bank 1st MyPic Studio Debit Card. You consent (or have obtained consent from the Image's owner) to Bank 1st storing, modifying, copying or using the Image for purposes of your Bank 1st MyPic Studio Card. You shall indemnify and hold harmless Bank 1st, its successors and assigns, against any claims arising or loss suffered by Bank 1st resulting from your use of this service or as a result of the Image being used on and reproduced on your Bank 1st MyPic Studio Card, or arising out of or as a result of Bank 1st storing, modifying, copying or using the Image. Bank 1st's liability hereunder is not liable to you for any loss, damage, claim or expense whatsoever in relation to any action by Bank 1st permitted under these Terms and Conditions. 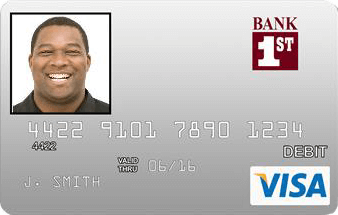 Bank 1st is not responsible for poor-quality Images or Images poorly positioned on the Bank 1st MyPic Studio Debit Card template. You Bank 1st MyPic Studio Debit Card remains the property of Bank 1st and you agree to immediately return it or destroy it if asked by Bank 1st for any reason, or if the card or accounts that your Bank 1st Debit Card is linked to is/are closed. If approved, the Image will be stored by Bank 1st or its agents and contractors for a period of at least three (3) years. 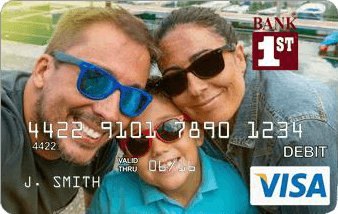 The Image will be printed on any subsequent reissued Bank 1st MyPic Studio Debit Cards within a four-year period unless you have uploaded another Image within that period. 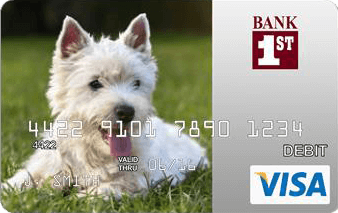 Bank 1st reserves the right not to accept or use any Image you submit, or to refuse to issue a Bank 1st MyPic Studio Debit Card for any reason.